Lightweight and durable, the Whitefang Pickleball Paddle is balanced and ideal for playing pickleball on an outside court. The paddle had a graphite face and a honeycomb core. This unique core give players 10 percent more playtime with this paddle than traditional paddles. One feature that makes this paddle particularly good for playing outdoors is the super thin but strong edge guard that protects the paddle and helps reduce mishits. The high-tech, polymer honeycomb core coupled with the size and weight, make the Niupipo Pickleball Paddles one of the best for outdoor games. The paddle’s unique core design make it easy to handle and maneuver meaning more precise hits. 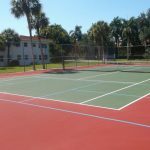 The Niupipo is made out of super durable material that helps it last longer even when using it on outdoor courts. Ideal for more experienced players, this paddle can actually help you improve your game overtime. Made of polypropylene, the Upstreet Graphite Pickleball Paddle was made with the outdoor pickleball player in mind. Like most outdoor pickleball paddles, it also has a honeycomb core. The core is made with the same polypropylene plastic as the paddle itself. This gives the paddle a unique bend. That increased flexibility gives the player more control over where the ball goes when they hit it. Durable and easy to maneuver, the Upstreet Pickleball PAddle is one of the best outdoor pickleball paddles. This is a plain and simple pickleball paddle. Made entirely of strong but flexible wood, the Rally Meister Pickleball Paddle is perfect for outdoor games. It is super lightweight and has a comfortable, cushioned grip. Approved for professional-level play, the Rally MEister Pickleball Paddle also has a wrist strap to ensure that they paddle doesn’t go flying off a players hand. This is especially helpful on concrete courts where the paddle could get scratched if accidentally thrown. The Amazin’ Aces Pickleball paddles were carefully designed to maximize quality without pushing the price too high. Made of graphite, these paddles are super durable, lightweight, and easy to play with. The graphite also prevents denting and scratches from happening to the paddle during play increasing the amount of time you can play with it. If you are a pickleball player who is just starting out playing outside, this is the paddle for you. 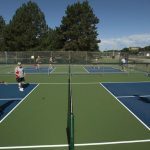 While it is possible to play with almost any pickleball paddle on both an outside court and an inside court, there are some paddles that are just more up for the task. Choose the right paddle for you and boost your game on the outside courts.